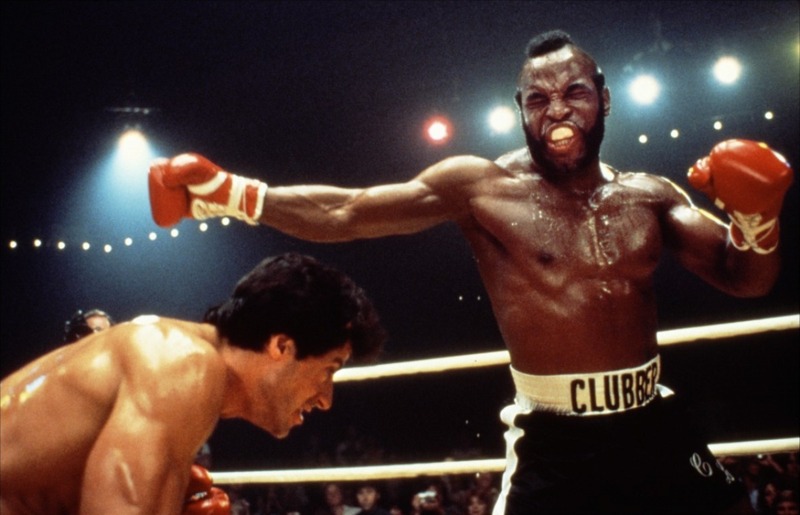 Clubber Lang vs. Rocky in Rocky III (screen shot), 1982, February 18, 2012. (http://media.comicvine.com). The fight that changed my approach to Humanities and put me back in a determined frame academically happened on this date thirty years ago. After all of these years, I find it awfully strange to look back and find that some of my more poignant moments growing up were ones of rage, resistance and renewal. All either around abuse, muggings or fights with classmates. Strange because I’d never seen my immature and thin-skinned self as much of a fighter before that day in February ’82 (see my post earlier this week, “Quitting Before a Fight“). Strange because it often takes something only indirectly related to my struggles to cause me to regroup and fight for what I want. Strange in the ways that all immature preteen boys and girls who get into fights always are. It had gotten so bad that month that folks who wouldn’t have dared to mess with me at the beginning of the year — guys significantly shorter than me and guys who were so superior to me that they didn’t even notice me — started messing with and threatening me. JD (see my “The Contrarian One” post from February ’11) was one of those classmates. The week before the mid-February winter break, our homeroom/English teacher Mrs. Sesay was home with the flu. Our substitute’s idea of managing a classroom was reading a newspaper while the class engaged in verbal and physical combat. It seemed that no one was safe from strife that week, including me. JD decided that it was his turn to give me a hard time. A ten-second scuffle took place on Tuesday over the usual tweener issues of communism versus capitalism, or to use more sophisticated language, neo-Marxism versus Keynesian economics. He also didn’t like that I had corrected him the month before about Australia’s official language, which he said was “Australian.” I learned that day that you should never correct a preteen contrarian when they think that they’re right. When I walked into the boys’ locker room for gym class that Thursday afternoon thirty years ago, I was greeted with two punches to my chin and face. He walked away and went through the green double doors to his locker, arrogant enough to think I wouldn’t respond. He muttered “stupid” as he walked away. I think it was the combination of being caught by surprise and being called “stupid” by JD that got the better of me. Or maybe it was five months of enduring public humiliation combined with the sense that things at 616 were spinning out of control. Whatever it was, I finally snapped. I stared blankly at the red lockers, green doors, and depleted beige-colored walls for a couple of seconds, and then my mind exploded in violent colors. I threw my entire being into JD as he had started to undress at his locker, knocking him to the floor. I choked and punched him until I had bloodied his mouth and made his nose turn red. JD attempted to fight back to no avail, as I kept my weight on his legs while I head-locked him with my left arm and wailed away with my right hand. Just as I began to run out of energy, the gym teacher came in to break us up. He yelled at us and asked “Do you want to be suspended?” When I got off the floor to go my locker, I almost couldn’t believe that I had won that fight. I went into the break with an emotional boost, one that I hoped would lead to better things for me at school. You could say that only a nerdy preteen boy like myself would find academic motivation in a fight. That’s definitely true. But, not just someone like me. Every kid who’s trying to find their way can only work with what he or she knows or what he or she is presented with. I could’ve either decided to keep being a punching bag — literally, figuratively and academically — or decided that whatever else I wanted to be, I needed to stand up for myself and fight. So yes, winning that fight with JD sent me into that winter break as if I’d thrown a Hail Mary to Hakeem Nicks just before halftime for a touchdown. It provided the inspiration I needed that I wasn’t getting from Humanities, A.B. Davis Middle School or 616. Where else would I have found it in February ’82?